All-on-4 dental implants in NY are long-lasting dental implants that can replace all of your upper and / or lower teeth with four anchor screws as opposed to traditional dental implants that utilize one screw for each tooth. This method of dental implants is also known as teeth in a day, as patients can be fitted with dental implants and go home in the same day. 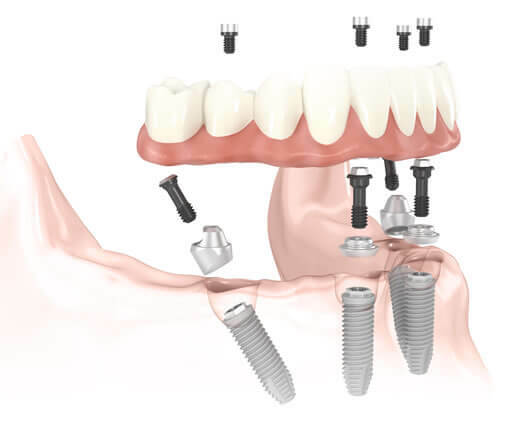 Because of the fewer number of anchor screws needed to securely fasten your dental implants, all-on-4 dental implants make your dental implant surgery and post-procedure care shorter and easier. Patients who replace their dentures with teeth in a day can care for their all-on-4 dental implants as they would care for their natural teeth with proper dental hygiene such as brushing and flossing. Unlike dentures, teeth in a day is a permanent missing tooth solution. All-on-4 dental implants are securely fastened to your gums and jawbone. Traditional dental implants use a screw to anchor each individual tooth, but all-on-4 dental implants only use four screws to anchor your entire set of teeth. Using only four screw anchors instead of one per tooth during your teeth in a day procedure shortens the recovery time. Patients who were not candidates for dental implants due to inadequate bone density may be able to receive teeth in a day. In most cases, bone grafting is unnecessary before receiving all-on-4 dental implants in New York. 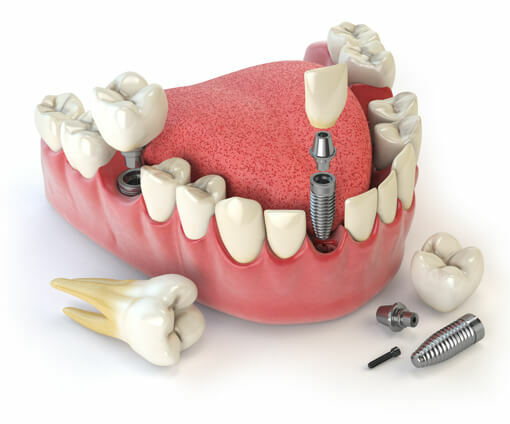 How can all-on-4 dental implants help me? Accidents, age, and advanced periodontal disease are some of the most common causes of tooth loss. High impact accidents may knock teeth out, and although your natural teeth are meant to last a lifetime, poor dental hygiene may lead to periodontal disease and the loss of teeth. Fortunately, our oral surgeons at Staten Island Oral Surgery provide all-on-4 dental implants in NYC to replace all of your missing teeth in one procedure. Teeth in a day is ideal for patients who have lost all of their teeth, have a majority of teeth that are falling out, or for those who already wear a complete set of dentures. The majority of oral surgeons recommend permanent missing tooth replacements such as teeth in a day over traditional solutions like dentures because all-on-4 dental implants look, feel, and function like natural teeth. If all of your teeth are missing or knocked out, however, teeth in a day may be an efficient and less invasive option for you. What can I expect from teeth in a day? Our oral surgeons perform teeth in a day at our Staten Island Oral Surgery office. All-on-4 dental implants can provide you with a full set of teeth in just one day. After you are sedated, any loose teeth will be removed prior to your teeth in a day procedure. Your mouth and gums are then prepared for the all-on-4 dental implants. The next step in your teeth in a day procedure is to make your new teeth. Finally, your all-on-4 dental implants are securely anchored into your mouth. All-on-4 dental implants require little to no downtime, and patients may even return to work the next day. Once your all-on-4 dental implants have integrated with your natural bone through the process of osseointegration, our oral surgeons will schedule a follow-up appointment in about six months to complete your teeth in a day restoration. Discover how teeth in a day can help improve your dental health and your daily life today by contacting our highly skilled oral surgeons. 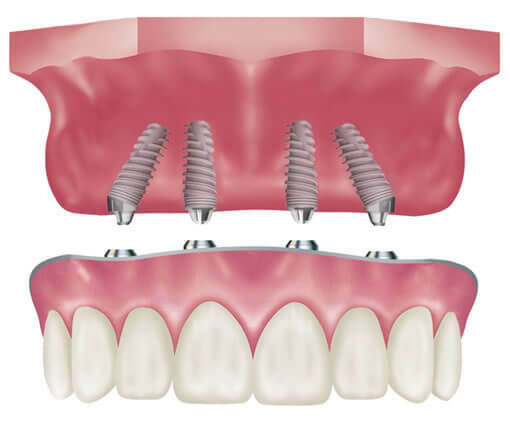 What technology do you use to place all-on-4 dental implants? With advances in dental implant technology, all-on-4 dental implants can be placed using guided dental implant surgery. This All-on-4 treatment concept provides patients with a fixed full set of teeth based on 4 strategically placed implants on the day of surgery. Dental implants placed in a single procedure means regaining your freedom to smile, eating your favorite foods, and solving long-term pain and issues. With decades of experience, our oral surgery group offers full-mouth dental implants using guided dental implant surgery in just 1 day. Our staff and team of dental implant specialists will work with your dentist to help plan your dental implant procedure, beginning with your initial consultation and ending with your final post-surgery follow-up appointment. At Staten Island Oral Surgery, we use the most advanced, state-of-the-art dental implant technology to customize a treatment plan to cater to your specific needs. A courteous, experienced member of our team will help you through the dental implant process to ensure that you understand all details of your dental implant procedure and that you will be happy with your results. The All-on-4 treatment concept is not only the least time-consuming treatment option, but it is also the least costly in comparison with conventional dental implant treatments. Zygoma implants are dental implants that are securely anchored into your zygoma, which is the curve of your cheek that is created by the joining of your zygomatic and cheek bones. Ideal for patients who are unable to receive traditional dental implants, zygoma dental implants are used for patients who do not have sufficient upper jawbone density. Zygomatic dental implants are created from a biocompatible titanium to reduce any possibility of your body rejecting these dental implants. After your zygomatic dental implants are placed, there will be a period of osseointegration, just like traditional dental implants. When osseointegration is complete, your dental implants will be securely anchored into your zygoma, ensuring stability and proper positioning. What are the benefits of zygoma implants? Zygomatic dental implants can be placed in one surgical procedure without the need for a bone graft. For patients with advanced or complete loss of teeth, the bone density of your jaw may be inadequate to receive traditional dental implants. Zygoma implants can successfully be placed by being anchored in the cheek bones, resulting in a natural-looking smile. Crowns can also be placed just three days after your zygomatic implant surgery. Zygomatic dental implants are a long-lasting solution to missing teeth, and unlike dentures or dental bridges, zygoma dental implants do not require special creams or pastes. Zygoma implants are strong, durable dental implants that are designed to act like your naturally-occurring teeth. Patients with zygomatic implants can eat virtually any food without the concern of their teeth shifting or loosening, which may occur with dental bridges or dentures. Am I a good candidate for zygomatic dental implants? You may be a candidate for zygomatic dental implants if you have previously been told you cannot receive traditional dental implants because the bone density of your upper jaw is too low. Zygoma dental implants can help you achieve a full smile without the need for bone grafting. Previously, the upper jaw has been one of the most difficult areas to place dental implants due to lack of healthy bone density. With advancements in oral surgery like zygoma dental implants, patients who previously may not have been able to receive dental implants may now be candidates. If you have low bone density in your upper jaw due to periodontal disease or another medical condition, zygomatic dental implants may be right for you. Our Staten Island dental implant specialists will discuss your dental implant options and which dental implants may be best for you. How long will zygoma dental implants last? Zygoma dental implants are a long-lasting missing teeth treatment that can provide strong, sturdy teeth in just one surgical procedure. Zygomatic dental implants are similar to traditional dental implants in that they are both designed to feel, look, and function just like your natural teeth. With proper dental hygiene and routine visits with your dentist, zygomatic dental implants are permanent missing tooth replacements that can allow you to properly chew, smile, and talk without embarrassment. How do I get started with all-on-4 dental implants? David Hoffman, D.D.S., F.A.C.S., Lydia J. Lam, D.D.S., Steve Yusupov, D.D.S., M.D., or Mark Stein, D.D.S., M.D. would be happy to discuss all-on-4 dental implants with you. Please call 718.226.1251 to schedule an appointment for a private consultation at Staten Island Oral & Maxillofacial Surgery.